Dr. Michael Schlossmacher grew up in Austria, trained at Harvard and now leads The Ottawa Hospital’s neuroscience research program. His research helped establish a key concept in Alzheimer’s disease and led to a clinical trial of an experimental therapy for Parkinson’s. He is now investigating the link between Parkinson’s and immune system. He will receive the Grimes Research Career Achievement Award from the hospital on October 28, 2017. As a young medical student in Austria, Michael Schlossmacher and his fellow students had to prepare a report on the possible causes of stomach ulcers. They stuck with all the conventional theories and got a good grade, but the report turned out to be totally wrong. At the time, evidence was just starting to emerge that stomach ulcers could be caused by a bacterium, but the establishment did not want to hear it. It was just too radical. When the truth came to light, Dr. Schlossmacher resolved that he would never again accept medical dogmas without questioning them and he wouldn’t be afraid to investigate opposing ideas. This approach has led to many surprising and important discoveries, netting Dr. Schlossmacher the 2017 Grimes Research Career Achievement Award from The Ottawa Hospital. After completing his medical training, Dr. Schlossmacher obtained a scholarship to visit Harvard University in Boston. With his mentor, Dr. Dennis Selkoe, he studied amyloid-beta protein, which accumulates in the brains of people with Alzheimer’s disease. He discovered that this protein is produced by all cells in the body, a revolutionary finding that is now a cornerstone of our understanding of Alzheimer’s. In 2006, Dr. Schlossmacher was recruited to The Ottawa Hospital and the University of Ottawa, attracted in part by Ottawa’s collaborative, multi-disciplinary Parkinson’s Research Consortium. He eventually assumed leadership of the hospital’s neuroscience research program and founded the University of Ottawa’s MD-PhD program. In recent years, Dr. Schlossmacher has pioneered the still-to-be-proven theory that Parkinson’s could be triggered by an infection, particularly in people who are genetically at risk. This is based partly on large, long-running human observational studies and partly on molecular studies of two Parkinson’s-associated genes, called alpha-synuclein and LRRK2. Dr. Schlossmacher and his team have made other important discoveries. For example, they dissected the pathway that links alpha-synuclein and GBA1. This led to a clinical trial of an experimental therapy for Parkinson’s in 2017. His team also developed a spinal fluid test for alpha-synuclein that is now used in all large observational studies of Parkinson’s progression. 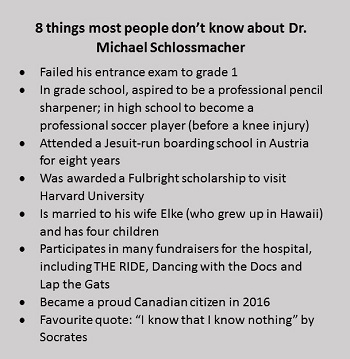 Dr. Schlossmacher says his scientific approach is inspired by his patients, rooted in teamwork, and fuelled by a willingness to challenge widespread assumptions, whether they be his own, or someone else’s. Dr. Schlossmacher’s research is supported by generous donations to The Ottawa Hospital, particularly through the Bhargava Research Chair in Neurodegeneration. He is also supported by the Canadian Institutes of Health Research, the Ontario Brain Institute, the Michael J. Fox Foundation, Parkinson Canada, the Weston Brain Institute and the Parkinson Research Consortium.